WASHINGTON CITY — The newest police officer for the Washington City Police Department was introduced at a ceremony at Washington City Hall Tuesday, Dec. 29. Unlike most officers, this newest addition had a leash, a harness and thick, dark fur. Officer Tank, a German Shepherd, officially became part of the K-9 unit and was handed over to his new partner, Officer Ryan Ericksen. Tank and Ericksen will live and train together. A crowd composed of law enforcement, city officials and their friends and family gathered to witness the introduction of Tank. Washington City Police Chief Jim Keith gave a few remarks, as did Mayor Ken Neilson and City Manager Roger Carter. Tank was raised as part of a volunteer, nonprofit organization called Havoc, the brainchild of Ricki Draper. Inspired to do more after witnessing dog handlers searching the ruins of the World Trade Center after 9/11, Draper began the program as a way to give back to law enforcement. The program raises the dogs from birth, training them until they are around a year old, when they are then handed over to law enforcement and first-responder agencies. The dogs are trained in law enforcement tasks and social skills. Without the volunteer time and money Havoc spent on raising Tank, it is unlikely the city would have been able to afford another K-9 unit, Keith said. “By having Havoc donate a dog to us it creates an opportunity that we otherwise wouldn’t have likely been able to have,” Ericksen said. To provide well bred, highly socialized, mentally and physically sound dogs to law enforcement departments and other first responders at no cost to reduce the financial burden to them, to increase the ability of more departments to put canines into active service and to increase the effectiveness of departments through the use of highly trained canines. The transition from a dog in training to official K-9 officer was marked by a ceremonial “changing of the vests” between Draper and Ericksen. Ericksen removed Tank’s training vest and replaced it with his official, Washington City Police Department vest, at which point Ericksen became Tank’s partner. Draper then gave Keith a certificate of adoption. The ceremony of handing over the leash from trainer to police officer can be an emotional time, and Tank’s ceremony had its share of tears. Both Tank’s trainer, Kiri Burns, and Draper had mixed emotions handing their charge over to Ericksen. The K-9 division is a great addition to the department, Keith said. It will be several months before Tank is ready to go on active duty, Ericksen said. His new partner will be ready to do basic narcotics work by spring 2016. Tank has already become something of a celebrity. 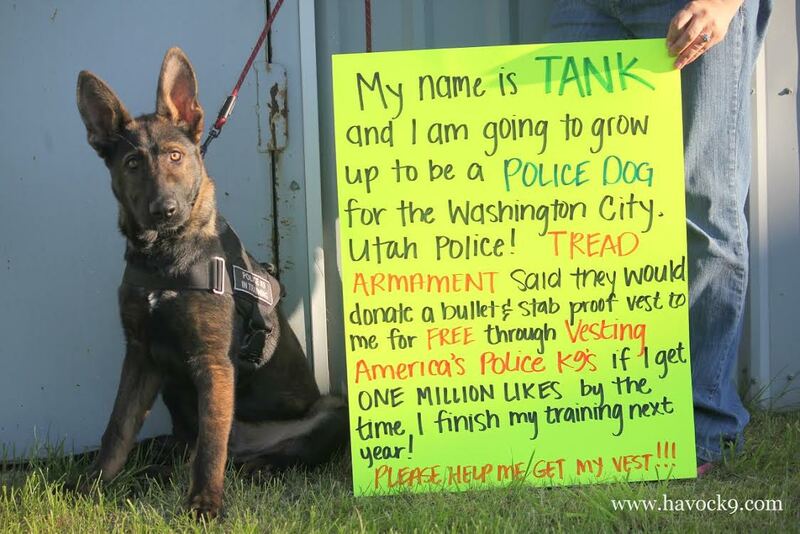 In June, Vesting America’s Police K-9’s group published a photo of Tank on their Facebook page, stating that if he received a million “Likes” by the time he completed his training in 2016, Tread Armament and Weaponry would give Tank a free stab- and bullet-proof vest. The photo received more than a million “Likes” in less than 48 hours. True to their word, Tread Armament and Weaponry was on hand to give the Washington City Police Department a gift certificate for the vest. 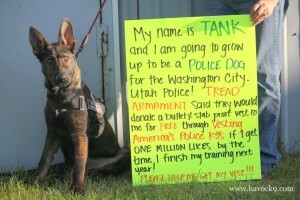 At only 11 months old, Tank still has some growing to do and won’t be ready for his vest until he is 19 months old. Uh oh, I see expensive payouts in city’s future, as lawsuits for accidental injuries by police k9 are on the rise. Case in point, last year a K9 ripped part of a Utah man’s face off while the man sat in a chair with his hands up. Google the video. Police stand by attack, yet city council unanimousily voted to pay the victim. Nice non-militarized name for a police dog. Hi Tank, you’re good looking. LOL I take it you haven’t been on a date for awhile. Oh wow Mesamans dad just became a cop !